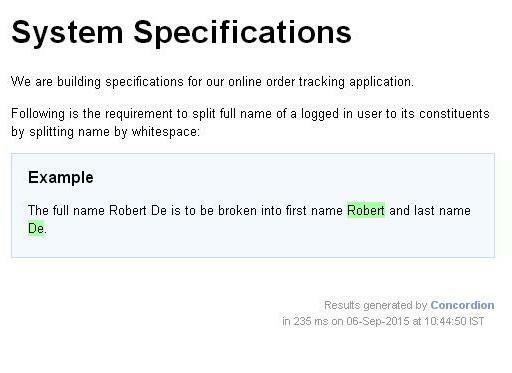 The full name Robert De is to be broken into first name Robert and last name De. Here we need to have a split function which accepts a user name and returns a result object having the first name and the last name as its properties so that we can use them. When Concordion parses the document, it will set the value of the special variable #TEXT as the value of the current element as "Robert De" and pass it to the split function. Then it will execute the split() method with parameters as #TEXT using the execute command and set the result into the #result variable and using the result object, print the firstName and the lastName properties as the output. 2 Add the required Concordion libraries using the Add External JARs option as explained in the Concordion - First Application chapter. 3 Create Java class System, Result under the com.tutorialspoint package.